Support your team and its fans! This full color 8.5 x 5.5 jumbo PC is printed on 100 lb cover. The writable surface allows fans to write in results of each game throughout the season. 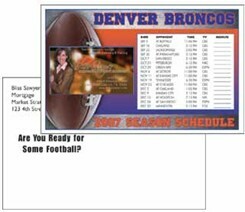 Customized with your team's colors, city, schedule and your business card size ad inserted on the front. Mail them, hand them out, distribute through your network partners, take to events, use as inserts.